company profile of RenQiu TaiXin Bellows Manufacture Co.,Ltd. Forming seamless metal bellows manufactured by Taixin are utilized for metallic hermetic seals volume compensators,pressure and temperature sensors, flexible connectors,, and countless other applications where quality, dependability, and long life are critical requirements. Till now, we have become a diversified enterprise integrating the production, sale, service, agent, and export. Our products are selling well in more than 20 countries and regions worldwide, such as the UK, The USA, Australia, Southeast Asia, Kroea , Iran ,India, Russia ,We are enjoying a good reputation in the international market. We would like to provide customers with high quality and low cost goods. 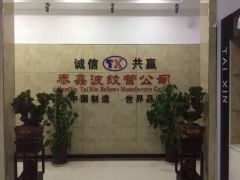 We welcome friends from all over the world to visit our company, and cooperate with us. Competitive Advantage: bellows are lightweight, seamless, leak tight, flexible and repeatable.